Towering over the entrance to the Straits of Gibraltar which separate Europe from Africa, only 14.24kms at the narrowest point, we find the imposing grey limestone Rock of Gibraltar. Likened to a crouching lion it has made brave men falter through the centuries that it has stood witness to history, so much history. For a small place it has loomed large as men fought, won and lost, which has made the name synonymous with the resistance for which it has become known, strong as the Rock of Gibraltar, and known in antiquity as one of the Pillars of Hercules. This self governing British territory covers 2.642 square miles and reaches 426 meters at its highest point and shares a 1.2kms land border with Spain, which makes it an isthmus and not an island as it is often erroneously referred to. Its name is a Spanish derivative of Jebel Tarik, (Tarik’s Mountain) the Berber general who led the initial incursion into Spain in 711AD. He used this mighty uninhabited Rock as a mere stepping stone, but the Moors brought the Barbary Macaques, or apes, whose descendents roam the Rock to this day, the only wild monkeys in Europe. They are a popular tourist attraction and never fail to amuse with their mischievous antics. Local residents are sometimes under amused with their forays into town on foraging sprees, but on the whole they are part of Gibraltar. 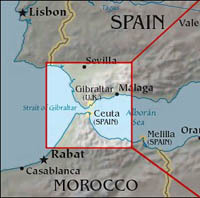 For a small area Gibraltar is densely populated (30,000, Approx), but it is not bare and barren as is sometimes thought. Over 500 different species of flowering plants grow around the Rock, and the Gibraltar Candytuft, endemic to the Rock, is the only place in Europe where it is growing wild. Olive and pine trees abound. Apart from the ape other mammals found are rabbits, foxes and bats. Dolphins and whales frequent the bay, whilst migrating birds are a common exciting occurrence. The Rock is home to the Barbary Partridge, the only specimen found on the European continent. Gibraltar has a Mediterranean climate, warm summers and mild winters and enjoys a diverse cultural heritage due to the racial and cultural infusion of many European immigrants over 300 years. The official language is English, though the population is mainly bi-lingual in English and Spanish as the British influence remains strong.